Coal fired boiler of chain grate is widely used in textile, printing and dyeing, paper making, chemical industry, food and other industries. It adopts membrane water-cooling wall, fully sealing structure, no air leakage, better combustion, not need insulation for its furnace wall, less weight. 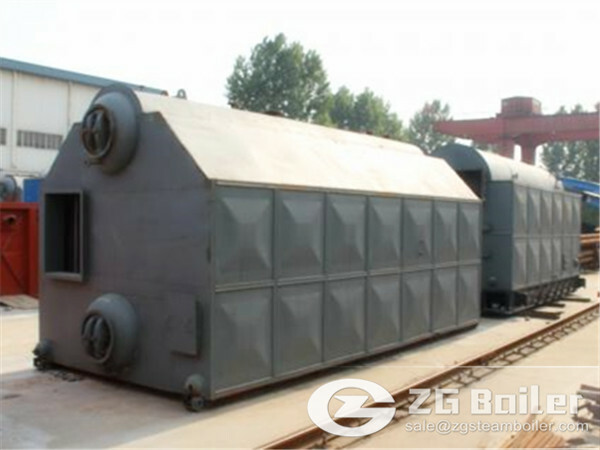 We have a type chain grate boiler for sale( SZL coal fired chain grate boiler) you can choose. 1.The boiler shall adopt double drum,monolayer arrangement,compact structure,as well as large heating surfaces which are more 10 per cent than those of same kinds of products,featuring the following advantages such as sufficient output,safe and reliable operation,short construction period ,and low installation cost. 2.The design of cyclone reburning chamber in furnace resulted in the decrease of dust contained in the flue gas.At the same time ,incandescent carbon black particles shall burn further ,enhancing the boiler thermal efficiency,and decreasing gas blackness,as a result,the gas emission concentration shall meet the requirements of grade A environmental protection area. 3.The grate shall employ the technology patent of small roller structure, boundary grate and so on, improving the operation reliability of the boiler. Threader pipe is arranged in the drum; a water wall tube at the left and right side of the furnace; combustion equipment uses the chain grate. The boiler is equipped with a blower, induced draft fan, gearbox grate, coal, slag, economizer, air preheater, ESP, electric control system, feed water pump, water treatment, main auxiliary deaerator and instrument valves. We are a powerful boiler manufacturer. We have been installed chain grate boiler in India successfully. If you want to know more information about our boiler, please contact us.